Des Traynor is the co-founder of Intercom, the easiest way for Web and mobile businesses to understand and communicate with their customers. This is an excerpt from the book Intercom on Customer Engagement, available for free download. 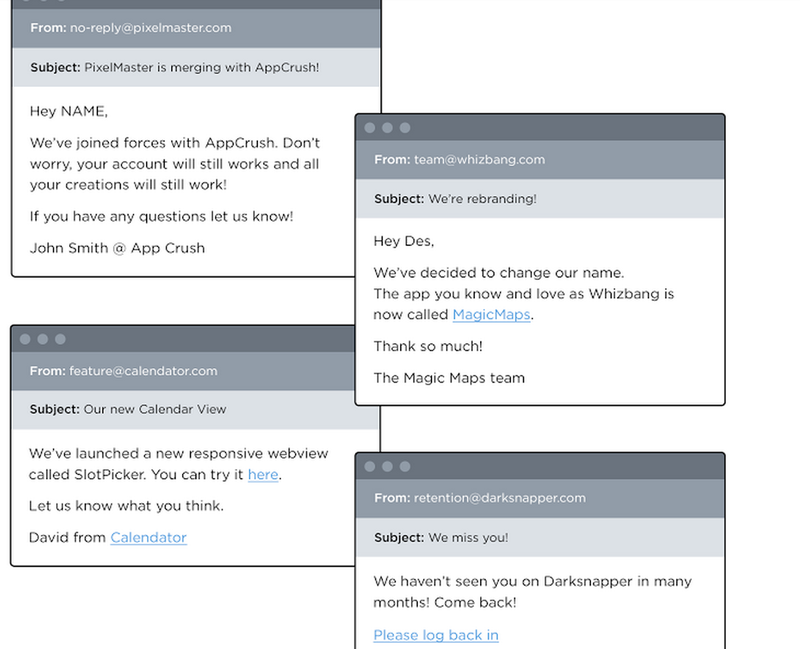 Sending an announcement about your product to your entire user base or email database is like writing a love letter and then addressing it “to whom it may concern”. It feels totally wrong to the recipient and no matter how compelling the body of the message is, you’ll have to fight hard to recover from that initial faux pas. It never makes sense to talk to all your customers, all at once. Never. When you send a message to your entire “user base” you treat them all as one big data set, not the humans that they are. Messages that don’t consider their recipient will fail. Not only that but the more precise you are in the targeting of your message, the more successful it will be. That’s why defining and targeting the right users is so essential to a successful messaging strategy. Much like it’s bad to base your behavior on an average conversion rate, it’s bad to write emails for the mythical “average user”. Remember that the “average” person has 1.96 legs and 9.7 fingers, and bet you don’t know too many people like that. Write for people, not for averages, and your messages will perform much better. The more specific your segmentation and targeting, the better you enable yourself to write. 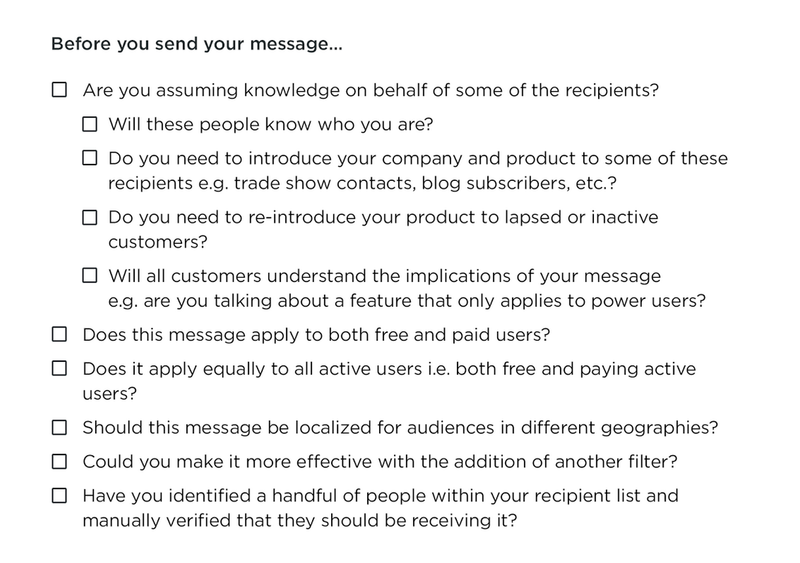 Writing a message to “all users” means you have to introduce your product, remind everyone what it is, what it does, why you’re writing to them, etc. All of this adds dead weight to the message for your active users who know it all. Do this enough times and they’ll just stop reading what you write. You’re teaching them to ignore you. Stop it. This is the group of users that are regularly logging into your product and using it. The exact parameters you use to define this segment will depend on the nature of your product. For example, if you run an invoice generation app, your active users might only log in once a month, and create a small number of invoices. But if you’re building a consumer photo sharing app you probably need to see a lot more activity in terms of sessions, likes, shares, and you might want a significant amount of photos uploaded. 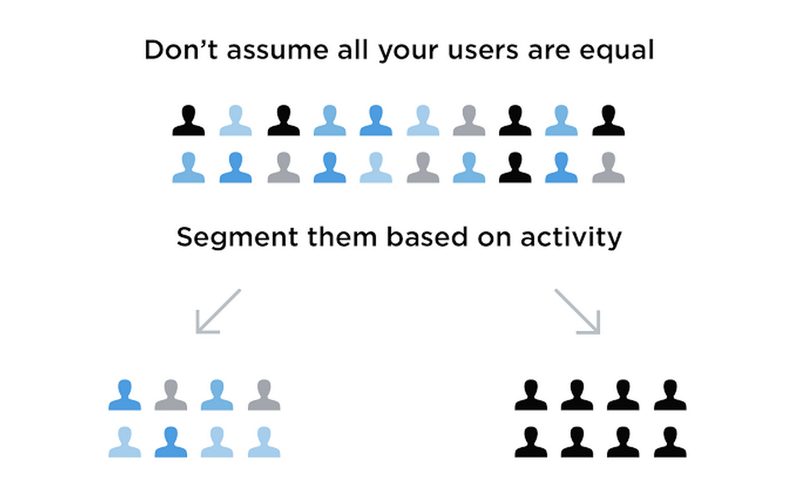 Engaged users are your regular customers. They’re loyal and depend on or enjoy your product often, so treat them accordingly. Don’t sell them a product they’ve already bought. Don’t promote features they’ve already used. Don’t pitch them things they can’t use. Instead, focus on things you think they should try, know, or master. These are the users who have not used your product in a meaningful way for an amount of time such that you can conclude they are no longer enjoying or depending on your product. In short, they broke up with you. These users should be handled delicately. They probably remember your name, and have a vague idea what your product does, but their impressions are likely out-of-date, and you’ve (hopefully) improved a lot since they last saw you. You need to focus on what your product can do for them, what news you have, and why they should check up on you again. False assumptions or false familiarity here is a guaranteed fast track to the trash folder. 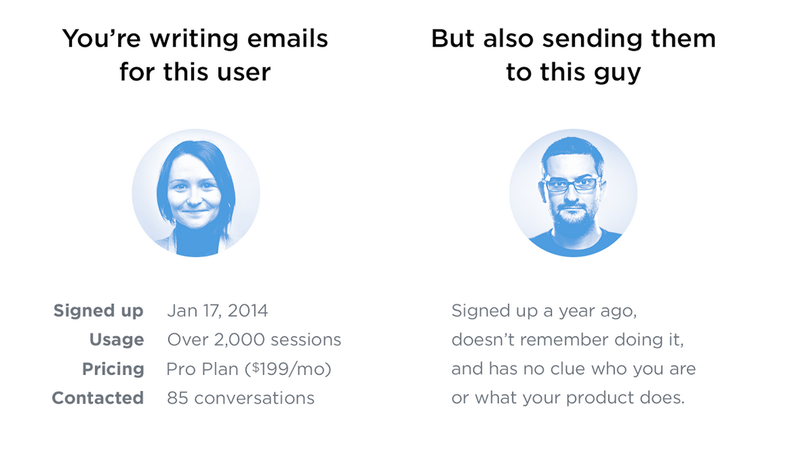 You can take this further: your disengaged users aren’t all the same either. Some were once power users, some were using your product for a few days. Some added their team, some never finished onboarding. Segment accordingly and the effectiveness of your messages will improve. Its a simple truth that not all customers are worth the same to your business. Many B2B apps will have a large amount of free users, often due to some form of a freemium model. Aside from being potential upgrades, free users can be a valuable resource for product promotion, product feedback, bug reporting and testing out new features for you. But with no skin in the game the opinions these people express carry much less weight than those of paying customers. Similarly free, engaged users are the right people to offer discounted upgrades. Customers who are paying you a lot of money may deserve to be treated differently than those on free or $9 a month plans. Depending on your business model you may want to further segment your paying customers – after all it doesn’t make sense to send a new feature announcement to customers on a plan that doesn’t entitle them to use it. A far better approach is to craft a message to users on your basic plan explaining what the feature can do for them and why they might want to consider upgrading to Premium to get it. If you’re offering free tickets to an event, sending out swag (e.g. t-shirts, stickers, branded notebooks etc), or hosting office hours for customers, you might want to offer it to your highest paying customers first. Having these types of segments will enable that. This one is easy to overlook but really important if you don’t want to annoy your users with messages every couple of hours. For busy people, there is nothing more likely to sour the relationship, than by popping up every day with messages which are vitally important to you, but seem increasingly trivial to the recipient. No matter the quality of the content, if you’re sending messages too frequently your users start to see it as spam, and will begin to ignore you. We’ve all been guilty of this – judging a message to be important because it is important to you but not considering how important it is to your users. If you want feedback about how to improve your calendar feature, then you need to talk to folks who use it. If you want to find out why adoption of a feature is slow then you need to talk to the people who aren’t using it and ask them why. Maybe they can’t find how to access it? Maybe it’s too intimidating? By tracking who is using a feature you can quickly communicate with people who have tried it and adopted it. Again, only you can judge, based on the typical usage of your product, what tips someone into the power user category. Is it creating 100 events on the calendar? Uploading three photos? Inviting more than three teammates to collaborate? Invoicing over $1 million? Whatever the criteria you don’t want to be sending people in this group basic product information which they will find patronizing and irrelevant. It’s very useful to define your most important customers who you want to ensure get the highest level of service, which might include things like regular check-ins, priority customer support, or early access to new features. This group are not necessarily the customers who pay you the most. For example you might have an early stage startup paying for your entry level package but if its been founded by someone who sold their last company to Facebook for a billion dollars, you may want to roll out the virtual red carpet. Examples of others you might want to include here are hyper growth start-ups, well connected individual users e.g. tech journalists, and/or people you know in real life who have been supportive of your business. It’s good practice to maintain a trusted tester group, who will have access to your bleeding edge features and who are, in general, fault tolerant and forgiving. These users are the ideal people to solicit input from on half- baked or future facing ideas. Every product has them – users who, how can we say this, can be a little difficult. They might be the guys and gals who call you out loudly on social media, before quietly acknowledging later that actually the problem was on their side. If you want to make your life considerably easier it may be worth developing a distinct messaging schedule for this group, and only contact them with your most significant announcements. It’ll also help your customer service team if they can easily identify members of this group when they reach out for help. This is the cohort who once used your product frequently but have now slipped away. Your messaging should be focused on showing them the improvements you have made since the last time they used your product. You are trying to convince them that your product offers significant more value now than when they last used it. The key piece of information you want from this group is why they cancelled. You may not be able to change their mind even if you address the issues they raise but at least you can prevent it being a deal breaker for other users. And at the end of the day, when they’ve cancelled their account is not the best time to convince them how great your product or service is. When you know what you are trying to achieve, the people you are trying to change the behavior in become obvious. Having precise segments at hand will streamline customer communications, which should ensure that you’re never tone deaf when you speak to your customers. As a result, they learn to listen to you, not archive you. Download the free book Intercom on Customer Engagement to learn how to influence your product’s usage by sending effective messages to the right users the right way.